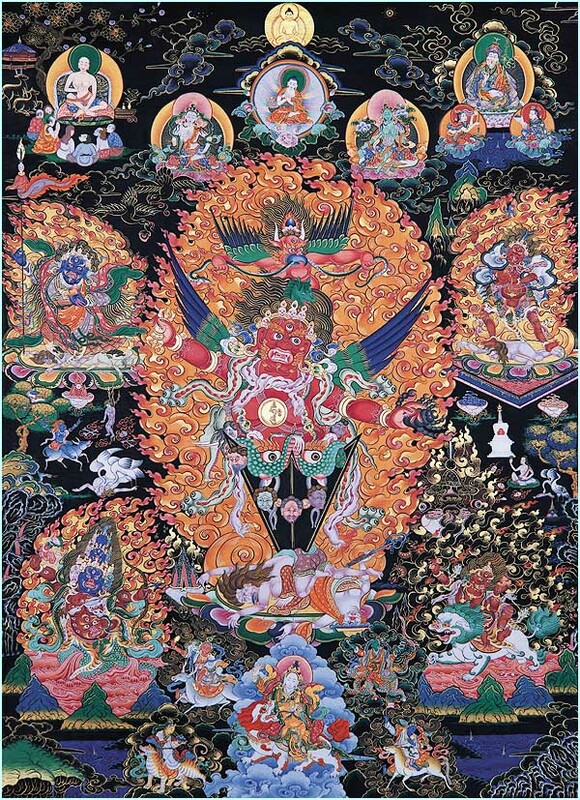 One of the most effective Buddhist practices for controlling negativities is Guru Tragphur, a wrathful manifestation of Padmasambhava (Guru Rinpoche). There are many problems today with illnesses such as cancer and AIDS. These illnesses are said to be related with provocations by various classes of negative beings or entities. If this negative energy is left uncontrolled and illnesses are treated only with medicine and therapy, they cannot be cured. However, if the source of negativity is understood and the correct practice is used to control it, together with therapy and medicine, then it can really work. It is therefore important to understand these provocations. The Gyalpo is a very big and very provocative class of negative energy. Where Gyalpos provoke, people become nervous; where there are Gyalpos there are wars, conflicts, problems, and a lot of confusion. Today the class of Gyalpo is a serious problem in our society. Provocations from the Gyalpos exist everywhere. Beneath the manifestation of Guru Tragphur there are two figures: the male form is a Gyalpo and looks like Gyalpo Shugden to show that we have this kind of problem in this age. For that reason if one practices Guru Tragphur one cannot receive negativities, the Gyalpos can never dominate. Many of us are opposed to the activities of Dorje Shukden in perpetuating the dominance f a tiny cult within the Gelug tadition extant in pre-invasion Tibet here in the West , Tzong ka pa’s Prasangika Nazis (NOT Tzong Ka Pa-he cool!) These are clearly the people that suppressed Beesley’s book, “A Cuckoo in the Peacock Palace” . We realise that Guru Dragphur is the perfect solution to this evil deityBUT WE HAVE NOT RECEIVED THE INITIATION.How do we proceed? Seek a qualified holder of the transmission and discuss with him the options. I wish you luck. Chogyal Namkhai Norbu Rinpoche gives these initiations and his protection and even the necessary lungs via webcast. At the moment he is not well but when he recovers soon these will be resumed. Once the lungs are received, even by webcast, the restricted practice books can be bought from Italy or Austria or USA centres after you tune into any of his webcasts. As on the last day of any webcast retreat (most are open to non-members) he always gives Guru Tragphur and other main practice lungs. At his retreats he also blesses certain multi coloured woven cords for protection for those who register for it on the first day with their date of birth given. He says once you trust him to protect you, he will, as he is more powerful than that evil gyalpo, specially he says if you do Guru Tragphur practices. Guru Tragphur practices can be of varying length and have their restricted booklets and he even teaches the instant mantra/visualisation version which suffices.